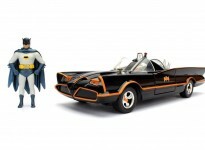 Andy Garringer is one of the most knowledgeable 1966 Batmobile officianados on the planet. As one of the Pimp My Batmobile development partners, we are poud to have his keen eye and skills on the job. Andy has created decals and photo-etch sets for other scales and kits of the Batmobile in years past that have graced some of the best Batmobile models in the world. Wait until you see what we’ve got cooking with Andy for the Hot Wheels diecast Batmobile!